if you're expecting Google to get to work integrating the recently-acquired Waze traffic app within Google Maps, then you may be waiting a little while yet. The search and mobile giant has told the Office of Fair Trading, it won't be fiddling with the community-sourced application until the regulator decides whether it has final say over the deal. Those concessions, published today on the OFT's website, include a vow it will not take action that'll "lead to the integration of the Google business with all or any part of the Waze business." Google also promised not to "impair the ability of the Google business or the Waze business to compete independently in any markets affected by the acquisition." 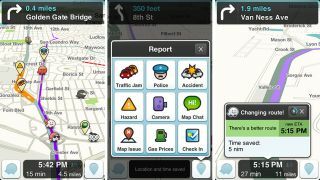 The Israel-based start-up Waze has built up a huge community of users who provide real-time traffic, accident, and speed trap information, while also keeping customers abreast of the cheapest petrol prices. It is assumed that Google will seek to integrate this tool into its own Google Maps navigation services for iOS and Android, but the company is yet to confirm its plans. As it often does, the OFT announced last month it wished to take a closer look at whether the $1.1 billion (around £686m) deal affected the ability of other platforms to compete with a Google/Waze double act. Regulators in the United States are also taking a closer look at the deal.